Skidz Grind plates give you the ability to grind hand rails, benches, ledges and much more. Skidz Grind plates are a groundbreaking new concept that can revolutionize how easy it is to enjoy extreme sports in a millisecond. This unique idea is creating a new category in the extreme sports market and promises to take the world by storm! We manufacture this product for the cheapest possible price that anyone can afford. As our product is geared towards everyone, it is important for us to keep the price affordable so even a 10-year old can buy one. Just keep them in your backpack and pop them on when you come by a sweet rail or something else worth grinding! 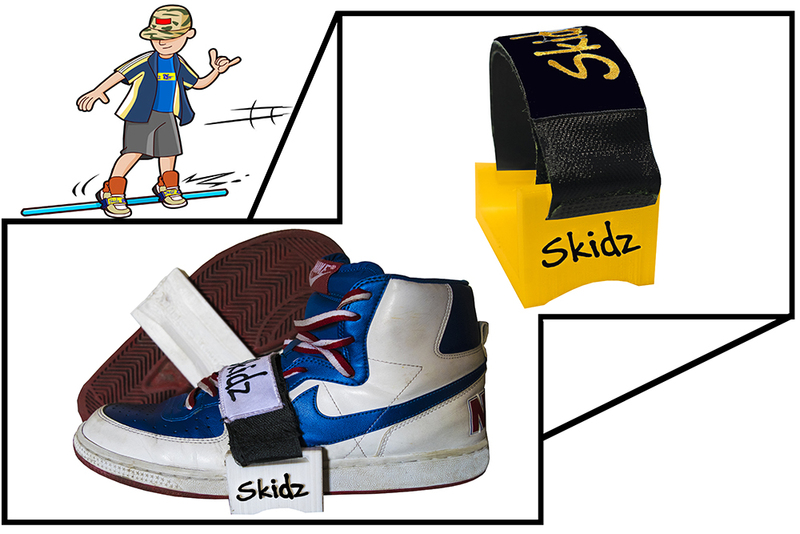 Skidz grind plates fit any shoe. Turning any shoe into a grind shoe. We have researched every corner of the planet to bring you the highest quality product for the lowest possible price, redefining the term “value for money”. We will be there every step of the way to ensure that care has been taken to reach perfection, to bring you the quality you will soon come to know and trust. So sign up to our competition to WIN great Skidz Products and keep upto date with our release date and new products.